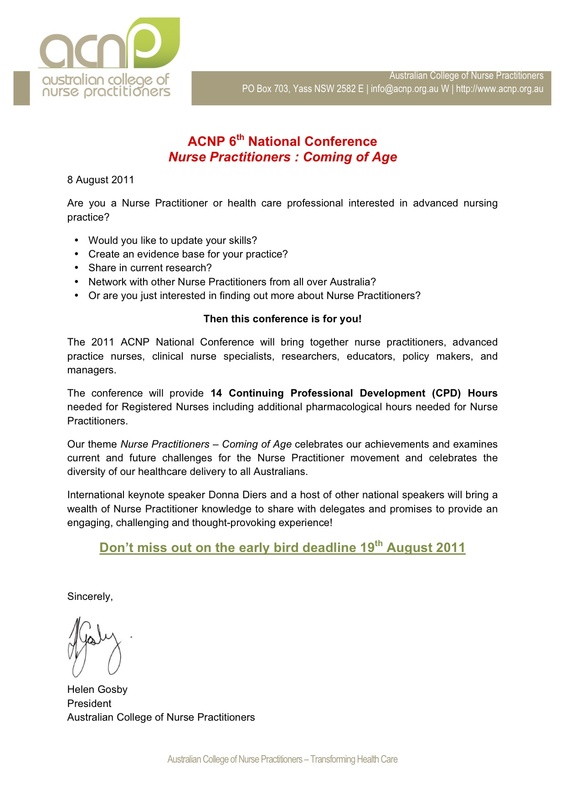 On behalf of the ACNP committee I would like to invite all Nurses, Nurse Practitioner Candidates and those interested in nurse practitioner issues to join us at the upcoming ACNP National Conference to be held in Adelaide on the 6th – 8th October 2011. The title of the conference is “Nurse Practitioners – coming of age” and as such the theme is celebrating our achievements and predominately examining current and future challenges for the Nurse Practitioner in the framework of healthcare delivery to all Australians. 5. Pharmacology and safe prescribing. We are excited to announce that we have secured an international speaker of great note; Donna Deirs, plus a line up of home grown national speakers with an international reputation. Personally I look forward to showing off Adelaide and all the wonderful attractions it has to offer.